This is the first month in a long time that didn't feel like it flew by! Normally I find myself saying "what?? The month is over already??". I really hope that the next few months slow down time-wise too. Most of the time I feel like there are just not enough time in the day to do all the things that I want to do on top of all my stay-at-home Mommy duties. 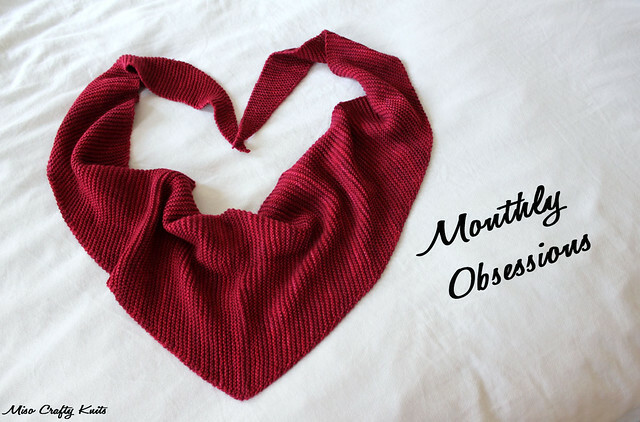 I have to admit that not too much knitting or crafting took place this month. 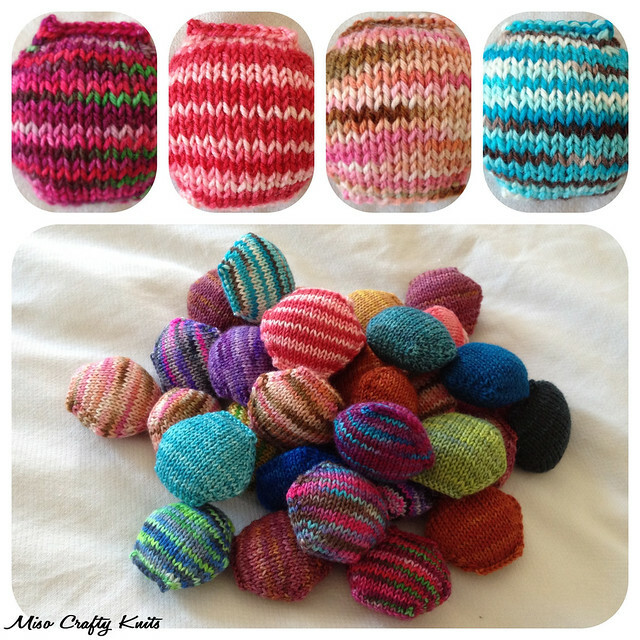 I was all gung-ho on the knitting front at the beginning of the month but then it got too sticky hot to knit even the little hexipuffs that I was feverishly knitting up. Ironically, it wasn't too hot for me to go on a jam making spree though! Yup! It was hexipuff madness around here...again! But like I said, it was getting really warm at the beginning of the month and then it was just too hot in the house to knit on anything other than hexipuffs! Oh, and having the Olympics and Ravellenic Games at the beginning of the month also helped to jump start the hexipuff knitting machine too! I'm sure you'll be seeing more hexipuff sprees and appearances on the obsessions list throughout the years (and yes, I said years...cause let's face it, this is quite the long term project!). Even though my first attempt at making strawberry vanilla jam was a bit of a bust (but is still edible and will be used) I was still determined to make proper jam. The second time around I decided to forego the use of a thermometer (seriously, one less thing to worry/think about, and the blasted thermometer was my downfall in the first jam attempt), and just go with the flow of a longer cook and using the plate test. The second attempt? A complete and total success!!! I don't think I could have been any more excited and was jumping for joy all throughout the day! And really, the popping sound that the lids make when it has sealed properly?? Beyond exciting and was totally music to my ears! I couldn't stop staring at my five (yes, FIVE!!) 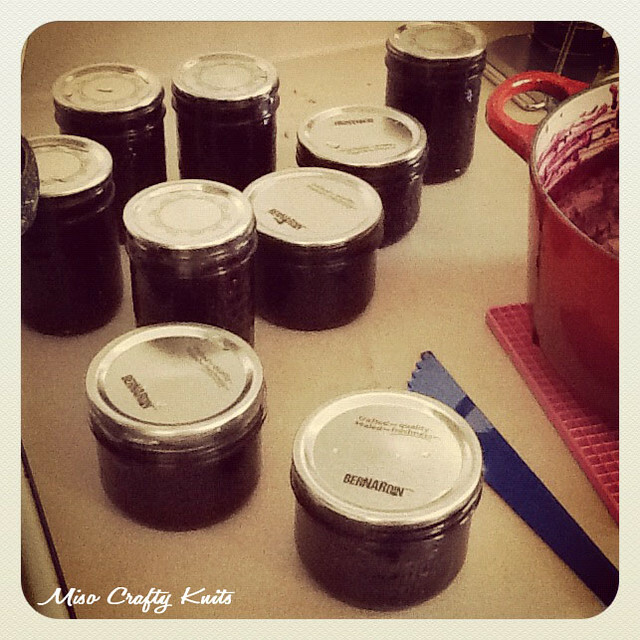 jars of blueberry-cherry jam! Since this batch was so successful I kind of went nuts and bought a ton of blueberries, cherries, and limes and made in total 21 jars of jam!! I wish I could say that this lot will last us a long time but we've already gone through almost 3 jars! I've always been a fan of those yogurt and cottage cheese cups with the fruit on the bottom but really didn't care for either the yogurt included or the selection of fruit being offered. Now that I have a cupboard shelf full of jam I've been making my own version using plain Greek yogurt (it's just so, so creamy and doesn't give me stomach aches!) and my homemade jam! 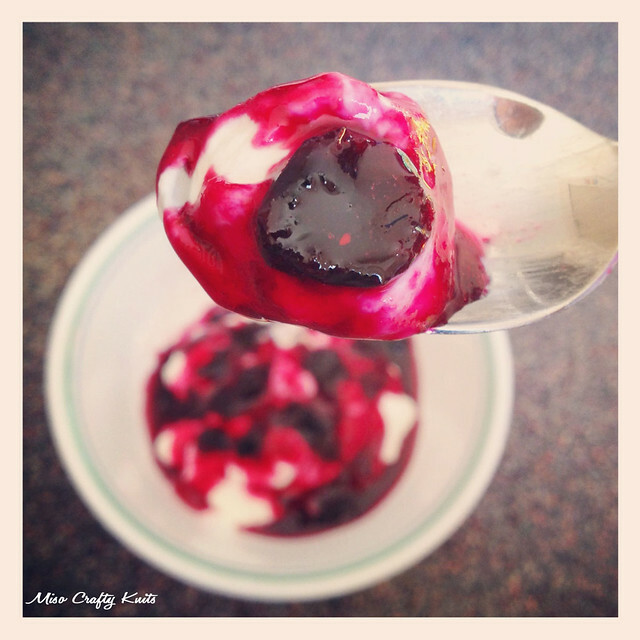 One of the blueberry-cherry batches didn't set properly but it's of a perfect sauce consistency that it was just made to be spooned over yogurt and ice cream. I've even gone as far as using some of the short, 250mL wide-mouth mason jars and pre-made a bunch of yogurt/sauce combos for those times when I'm on the go and need a quick, healthy snack stat! 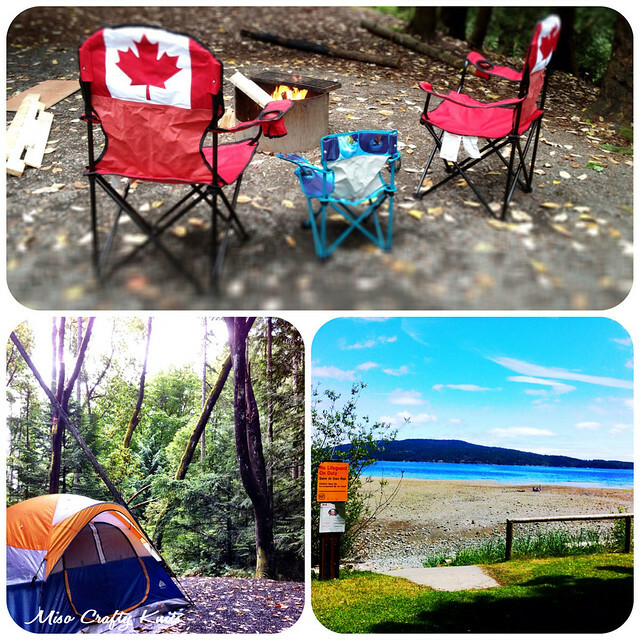 Ok, this one isn't an obsession but I have been thinking about camping a lot this month. Where to go, when to go, what to bring (cause 3 year olds really can't sit in front of a camp fire as long as you would like them to! ), and when can we go again! It's amazing how nature affects the Munchkin. He's just so much calmer and happier. And camping let's Brett explore the "caveman hunter" in him (I know, eyes are rolling here!). I just enjoy the peace and quiet, and it's so nice to get away from the hustle and bustle of every day life. As much as I dislike spiders and outhouses, not having to worry about bills and housework, and not being glued to electronic devices for a few days is really nice. So nice, it kind of makes me sad that fall is just around the corner and camping season will be over (I don't camp in the rain!). I've been thinking a lot about my wardrobe this month. Mainly because I really have nothing to wear, and the fact that my wardrobe needs a Major overhaul. Yes, that's major with a capitol M. I'm thinking it's about time to do a complete and total purge of my closet. Especially now that I've come to terms that some of my clothes will just no longer fit me. It's been almost 4 years since the Munchkin was born and both my feet and my rib cage will not shrink back to their pre-kidlet days. Yup, things that they don't tell you about being pregnant: that your feet can grow a full shoe size and that your rib cage can permanently expand. And after 6-12 months if they don't go back to "normal" than they never will. Le sigh. So...that all means I got to face the fact that a lot of my clothes and pretty much 95% of my shoes I can no longer wear. Not to mention that my tastes have changed and think some of my garments aren't "mommy-appropriate". As in some of my skirts and dresses are just too short, some tops are not long enough (bye bye belly baring days! ), and some pieces are just too constricting. You know how it is sometimes...you think "maybe I'll save this for when I have a daughter" or "maybe it'll come back into style" or "maybe I can let it out/get it tailored and it'll fit again". Yeah, this thinking is not good. It only creates unnecessary clutter. And maybe some bad self-esteem when you look into your closet and see the clothes that no longer fits. Anyhoo, so I've been really looking at what I have been wearing and trying to build my wardrobe from there. Ever since fashion school I've kind of been fascinated with the idea of a capsule wardrobe, but at the time could even consider trying it out (come on, I had a disposable income and had to keep up with the trends!). Now though? Now I can totally get with the program. Besides, my wardrobe already follows the capsule wardrobe rules, I just need to get a handful of pieces to make it complete. Don't know what a capsule wardrobe is? It's basically a collection of a few essential "classic" pieces that aren't dated, are kind of season-less, and can be mixed and matched to create several outfits. Awesome, right? You can update your collection by adding a few trendy pieces each season or by accessorizing. Typically the base collection would consist of a 1-3 base colours (I find my staples to be black and grey, with a few white shirts), and be of great quality (cause it's all about quality, not quantity...after all, you'll be wearing these items all.the.time). You are so cute. Jam...I need some of that jam......lol. if you need someone to help you purge, let me know! I love a good wardrobe overhaul! I think accepting the truth that I'll never wear most of the clothes in my closet is a HUGE step in the purging process! I just don't want to go overboard and start throwing out everything cause I've gotten so caught up, you know? i'm so excited for fall too! hrmmm i'm liking the idea of a capsule wardrobe... something to look into... your jam looks so yummy. even better that you guys are eating through it! ha. I love the idea of the capsule wardrobe. I have a lot of fun printed tees that I love, but as I'm starting to re-think where I'll be, career-wise, in the next few years, I'm thinking I need to pare down and create a more basic-yet-professional wardrobe. Of course, I'm also trying to lose weight and pay off a credit card while I completely re-think my closet, so I'm not making much headway. I know what you mean! Aside from trying to get my closet under control and to kind of live a more minimal life, I'm trying to pay off a credit card too. So the capsule wardrobe is right up my alley on so many levels. I'm sure if you took a really good look at your wardrobe you can come up with your own basics/essentials and build from there? Probably! Though I have to admit, the idea of limiting my color palette kind of terrifies me. My closet is arranged by color. IT'S LIKE A HAPPY RAINBOW IN MY ROOM. The whole colour thing used to terrify me too, cause I really am drawn to colour. But lately I've been finding that I either wear a bright "seasonal" piece (like a sundress) with a bright hand knit cardi or jeans and a black tee/tank with a pop of colour (re: a hand knit cardi) and accessorizing with even more colour. You can definitely add in the graphic tees into the equation. I'm not sure what your job is, but you can always pair the tees with dark denim (to me, jeans are a must and are "classic" essentials!!) or black pants, a simple cardigan or blazer with a shawl as a scarf/cowl? Making jam is on my new 101 in 1001 list that I am yet to post. I think I will give it a go while I am on maternity leave. Yay! :) Making jam is actually super easy, just a little time consuming. Can't wait to see what kind of jams you make! i moved 2.5 years ago and purged like you would not believe. clothes, miscellaneous crap that hasn't seen the light of day in years.. it was very liberating. i spend very little on clothes now. although i consider my fashion sense very pathetic, i seem to have acquired a number of items that i'd consider "classic", as i don't seem to follow trends very well. i also sew, so when the rains start again i'll be hauling out the sewing machine for some new tops. i prefer to spend the little of my "mad money" that i have on yarn in any event, although lately i have been digging through my stash, which i am quite proud of! It is liberating, isn't it? And really does make a huge impact on your stress levels! I find if you dish out on quality pieces in the first place, it really does cut down on how much you're spending on clothes in general. I'm really hoping that this fall I'll be able to sew up a few new items for the wardrobe too! Awesome post!! Always love a fav's list that I could have wrote myself!! That's so awesome that you've already got a capsule wardrobe in the making! Finally realizing what I really do wear from my closet and sorting (most) of it out has really helped me so far. And really does make getting dressed in the morning that much easier! :) I can't wait now to really get my closet in order!! Awesome post ! It contains very useful information about latest casual suits and fashion. Thanks for sharing such a valuable knowledge.